No, he can not breathe in space. Based on the anime, Saitama first looks around calmly, realizes he's in space, then covers his nose. While this isn't solid evidence, the fact he just didn't even realize this is probable evidence of one of two things: either Saitama does not require any breath and had passively stopped breathing at all, or he is simply such a broken character that he ignores logic until he realizes it's even there in the first place. Either way the air should have escaped from his body within seconds, so based on a logical standpoint I can only assume that yes, Saitama can breathe in space. 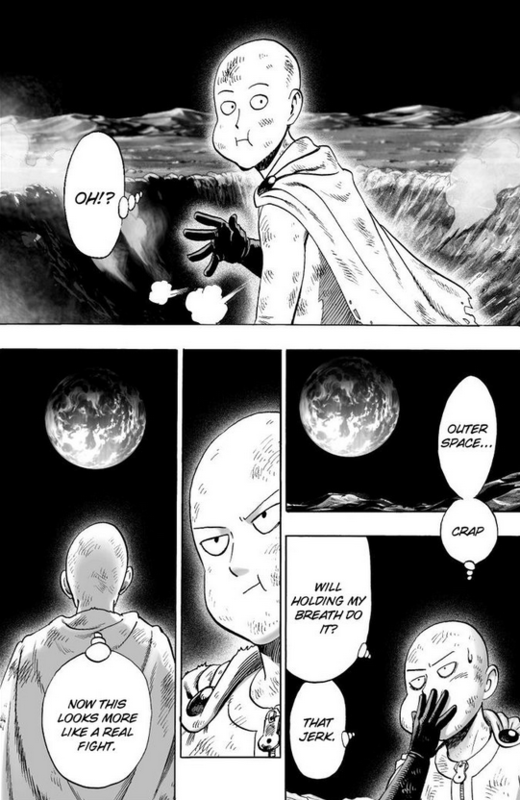 No matter how strong he may be, Saitama wasn't holding his breath until after a few seconds of being on the moon. the minute he left the atmosphere, the air inside him, which is normal oxygen and nitrogen, would be sucked out. Strength has nothing to do with his oxygen deprivation. No breath holding equals no oxygen, so no reaction to oxygen loss equals no oxygen dependency. Saitama can't die from space.